PBR takes pride in its formidable World Championship Trophy that, along with the sport’s coveted gold buckle, is part of the coronation capping every young cowboy’s dream – being named the world’s top bull rider. Redesigning the championship trophy that’s stood for a quarter century as the standard of excellence for the world’s top bull riding league for the next 40 years was no small task. It took 37 revisions, the work of some of the planet’s most talented designers and silversmiths and manufacturing work done over five months in three countries – the U.S., Mexico and Italy. 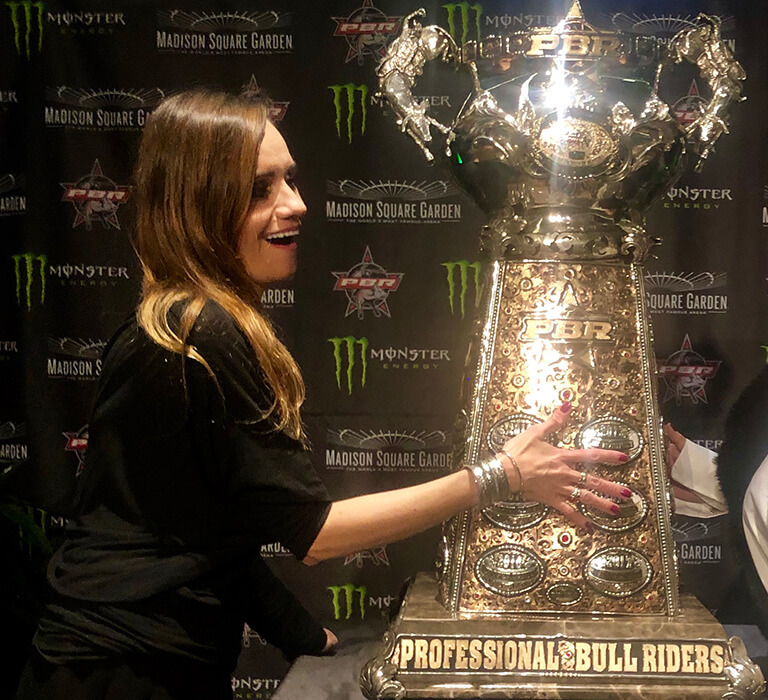 “Our main goal was to ensure we paid homage to the original PBR Championship Trophy while advancing the design in a way that speaks to current fans as well,” said Lance Neirby, VP Operations and Technical Designer, Montana Silversmiths. The impressive new trophy weighs 67 pounds – 10 pounds for the cup and 57 for the tower, which has 5.08 lbs. of gold and 30.8 lbs. of silver. The concho buckles on the cup are emblazoned with 64 diamonds. All that bling makes “The Cup” worth an estimated $500,000. Fans will notice a shorter pyramidal base to a more slender 8-sided tower and a brand new cup design. The main design element spoke to 8 seconds and had an 8-sided chute style rim with flatter handles. The ultimate design became much more classic in shape,” Neirby said. Manufacturing PBR’s new signature trophy took Montana Silversmiths five months to get the tower just right and ensure the handles on the cup were sculpted as realistically as possible, according to Neirby. Neirby has the chops and credentials to create a trophy that is truly a museum-worthy piece of art. He had worked at Tiffany & Co. and built hundreds of trophies, some of them familiar to millions, including the NFL’s Vince Lombardi Trophy, NASCAR’s cup, and trophies for the MLB’s World Series and the US Open, among others. Neirby teamed with bronze artist, Mary Michael, a longtime partner with Montana Silversmiths, who has been producing bronze sculptures for more than a decade, along with Justin Deacon, Head Designer and Master Engraver for Montana Silversmiths, a genuine cowboy with a reputation as an exceptional master engraver who can sculpt metal like clay. When PBR unveiled the new trophy at Madison Square Garden prior to the season opener on January 4, the dazzling piece of hardware, glittering so brightly it was difficult for some to photograph, received rave reviews. 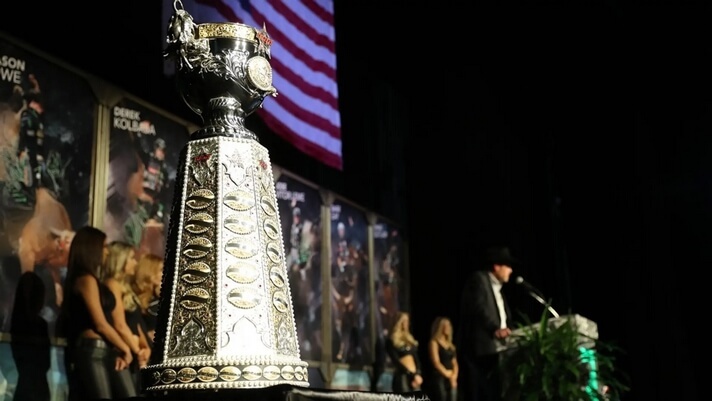 The initial iconic Championship Trophy, which has served the sport so well, is on its farewell tour and will get its last hurrah when PBR debuts at Staples Center in Los Angeles on Feb. 22-23 before being retired to PBR headquarters in Pueblo, Colorado. Fans will have the opportunity to see the old and new trophies side by side by being a part of the Elite Seats Tours at PBR Unleash The Beast events now through the Iron Cowboy in Los Angeles. Fans can purchase Elite Seat tickets at PBRTix.com or by calling PBR Customer Service at 800-732-1727.